Summer San Diego events July 2019. Kick off your summer with 4th of July fireworks then hit the San Diego beaches for a summer of fun. There are many free concerts, and so many events, including Comic-Con in San Diego! 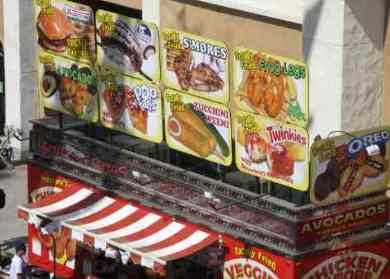 San Diego County Fair – open June 1 through Wednesday July 4 2018 at the Del Mar San Diego Fairgrounds (Interstate 5 at Via de la Valle). More San Diego family fun with concerts, flowers, rides, exhibits and more at the San Diego County Fair . This is one of the best of the summer San Diego events! July 4th is a popular day - enjoy the fireworks at 9:30 at the San Diego County Fairgrounds. July 4th Firework Displays - Summer wouldn't be the same without a San Diego Fireworks show. Check out our 2018 fireworks schedule and Google map of this all American event. San Diego Fireworks for your July fourth weekend celebration. July 4th at the beach - Monday July 4th will be a popular beach day especially if the weather is great. Be sure to plan for the rise in the tides before you set up your beach umbrella too close to the water. 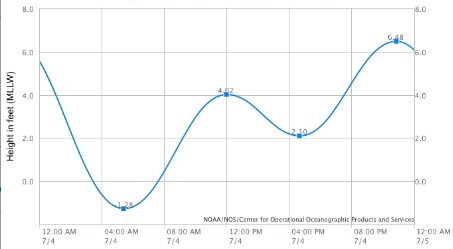 Refer to the tide chart above to see how the tides change throughout the day. If you pick a spot too close to the water in the morning, you may lose it later in the day. Choose your best beach in San Diego to spend a day at the beach. Carlsbad TGIF Jazz in the Parks - July TBD 2019 Friday evenings from 6 – 8 PM. Free outdoor summer concerts at various locations in Carlsbad, CA. Hotel del Coronado Historic Walking Tour - Tuesdays and Friday at 10:30 AM, Saturdays and Sundays at 2 PM. 75 minute walking tour of the famous historic Hotel del Coronado, let by docents from the Coronado Historical Association. $20 for adults, children 12 and under free. Reservations recommended. 619.437.8788. Kayak at La Jolla Shores - This summer is a great time to kayak at La Jolla Shores to see the Sea Caves, marine life, and leopard sharks. Several different companies offer kayaking tours, or you can launch your own kayak at the free boat ramp. One of the best San Diego events. July is a great month, but make reservations. For more information see La Jolla Kayaking. 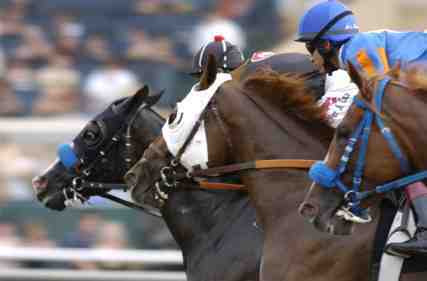 Hollywood California - Drive north and visit the world famous Hollywood. Tour a movie studio, hike to the Hollywood sign, shop on Rodeo drive, find your favorite star on the Hollywood walk of fame, visit Universal Studios and more. 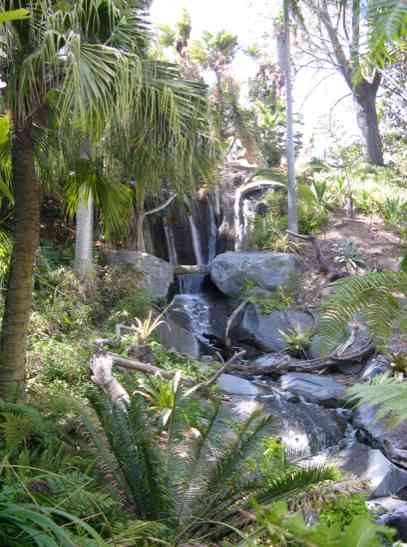 Check out the best the Hollywood Attractions. Over the Line Tournament - Sat and Sun, July dates TBD 2019 from 7:30 AM to dusk. Ages 21 and up only. Mark your calendars, as it is just about time for the Annual Over the Line Tournament. You may be asking, “What is this Over The Line tournament?” Well, it is said to be one of the last pure Southern California traditions left untouched by commercialism. It is truly just a ball and bat game played with 2 teams and 3 players on each. There are no foul lines. It is played without gloves and pretty much only wooden softball bats and balls are used. July 4th Picnic and Fireworks - La Jolla Shores and nearby Kellogg Park is a great place to picnic and enjoy the beach on the 4th of July. Arrive very early to find parking and claim your spot for the day. Fire works are scheduled over La Jolla Bay at 9 PM. 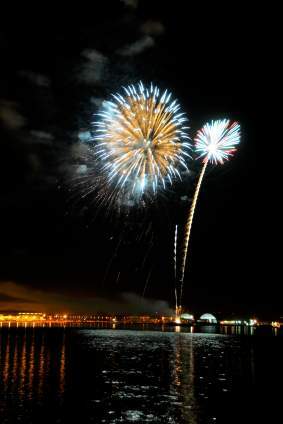 Annual Big Bay Boom July 4 Fireworks Show Popular San Diego events July 4th 2019. Join the crowds in downtown San Diego at 9 pm in this large fireworks display, expected to be the largest in San Diego area. Pick your favorite spot near Seaport Village, Coronado Ferry Landing, Spanish Landing, Embarcadero Marina Parks North and South, Cesar Chavez Park, Coronado Tidelands Park, Shelter Island and Harbor Island. Fireworks will be discharged simultaneously from barges placed off Shelter Island, Harbor Island, and North Embarcadero. Call (619) 686-6200 for parking and shuttle information. One of the best San Diego events for 4th of July. San Diego Beaches - July through October are the most popular months at the San Diego Beaches and North County Beaches. Browse through our pages of beaches, or see our 101 Things to do at the Beach. La Jolla Concerts by the Sea - Note this concert series ended in 2016. Encinitas Sunday Concerts by the Sea - Sunday July and August dates TBD 2019 from 3 – 5 PM at Moonlight State Beach in Encinitas. Bring your beach blankets. Fun free San Diego events in July..
San Diego Dog Beaches - Take your dog to the beach! Choose your favorite San Diego Dog Beach from all the ones we have listed. One of the best San Diego activities for dogs and dog lovers. San Diego Dog Beaches. Balboa Park Free Museum Tuesday for Residents and Military - Some Balboa Park museums are free on 1st - 4th Tuesdays of each month to locals (San Diego Cal. City & county residents), and active military and their families. The free admission is on a rotating basis. Check out the Free Tuesday Balboa Park museum schedule. Solana Beach Triathlon and Duathlon - Sunday July TBD 2019 starting at 6:50 AM race at Fletcher Cove Park. 2000 athletes are expected in this fun summer event. San Diego Harbor Waterfront – For a fun day in San Diego activity, enjoy a stroll along the San Diego waterfront and admire all the historic ships. See the historic ships. Walk down to Seaport Village and visit the unique shops. For the young kids, reward them with an ice cream cone and a ride on the merry-go-round. Things to Do in San Diego - For more San Diego events , check out these Things to do in San Diego, San Diego Events August and 101 Things to do at the Beach. Featuring events in San Diego and the beach towns of Oceanside, Carlsbad, Leucadia, Encinitas, Cardiff, Solana Beach, Del Mar, La Jolla, Coronado, Pacific Beach, Ocean Beach, Mission Beach and Imperial Beach California. These are some of the most popular San Diego attractions to see in your San Diego or Southern California vacation.